Our Gav recently enjoyed three months and 3,000 miles driving a Seat Alhambra, a ‘practical and flexible’ seven-seat people carrier. He declared it a ‘prime example of a properly sorted MPV’ and ‘worthy of your attention’. Well, sorry Gav, people just aren’t listening. Sport Utility Vehicles are where it’s at, you see. Most of us venture no further off-road than mounting a kerb, yet sales have skyrocketed in recent years – and that trend is forecast to continue. Buyers like the high driving position and perceived safety of SUVs, but mostly they love their tough, go-anywhere image. If an MPV is a sensible sandal, an SUV is an all-terrain trainer. 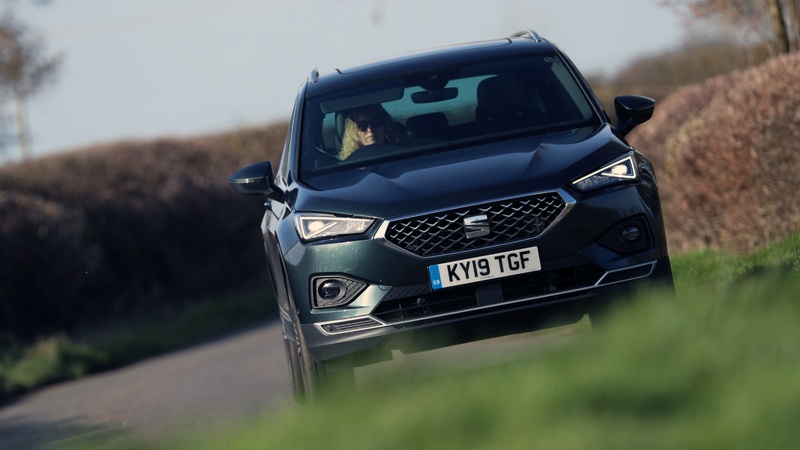 Seat has jumped wholeheartedly on the SUV gravy train. Its new seven-seat Tarraco sits above the (small) Arona and (medium) Ateca in a three-tier range. It’s the Barcelona brand’s new flagship – and the aspirational alternative to an Alhambra. Driving the new Seat Tarraco today. Two TSI petrol engines are offered – 150hp 1.5-litre and 190hp 2.0 – plus a 2.0 TDI diesel available in two outputs: 150hp or 190hp. You can opt for two- or four-wheel drive (‘4Drive’), plus six-speed manual or seven-speed DSG auto transmissions. Tarraco prices start at £28,335 for a 1.5 TSI 150 SE and stretch to £38,055 for a fully-loaded 2.0 TDI 190 Xcellence Lux. I ventured to deepest Berkshire to sample 190hp petrol and diesel versions on UK roads. ‘Tarraco’ is the old word for Tarragona, following a longstanding tradition of naming Seats after Spanish cities. Underneath, however, its roots are resolutely Germanic. The Tarraco is based on the same Volkswagen Group MQB-A LWB platform as the Skoda Kodiaq, and the two cars are mechanically nigh-on identical. The Seat has more aggressive SUV attitude, though. It rides 20mm lower than the Kodiaq, with a jutting grille, bonnet bulges, sculpted body-sides and swoopy LED light signatures. This year’s must-have styling feature – a full-width rear light bar – is also present and correct, although the central section is only a red reflector. Those ‘tailpipe’ slots either side of the rear bumper are fake, too. 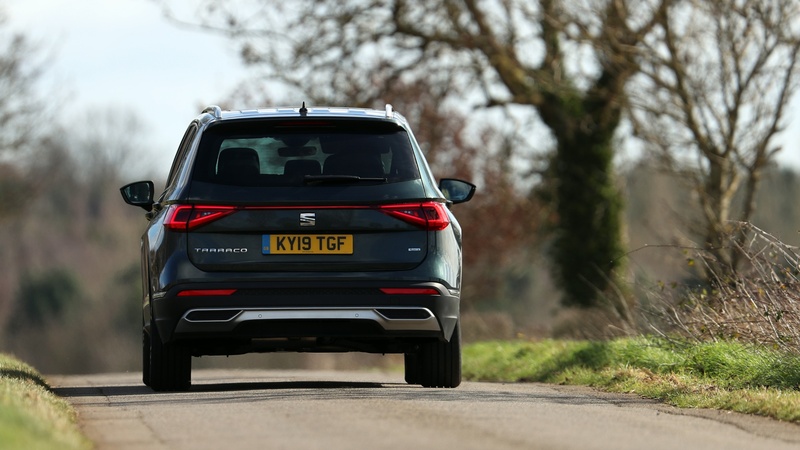 Here’s where Seat’s oh-so-sensible Alhambra plays its trump card. 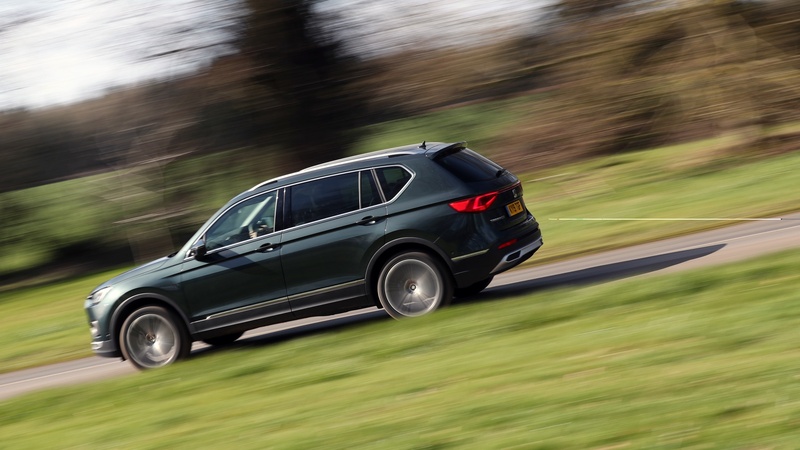 The old-guard MPV is a true seven-seater (“Whenever we’ve carried a full quota of five children, there’s been a scramble for the rear seats,” says Gav), while the young-gun Tarraco is effectively a five-plus-two. Its rearmost chairs are only really suitable for youngsters, yet have no Isofix mounting points. You do get three Isofix points in the middle row, though. Five-up, the Tarraco feels very spacious. There’s ample headroom and shoulder width, and the optional panoramic sunroof bathes the cabin in light. The second-row seats also slide and flip forward individually. Boot space ranges from 2,005 litres in ‘van mode’ to 700 litres with five seats occupied – and just 230 litres when fully loaded with passengers. All figures, incidentally, are fractionally smaller than the Skoda. 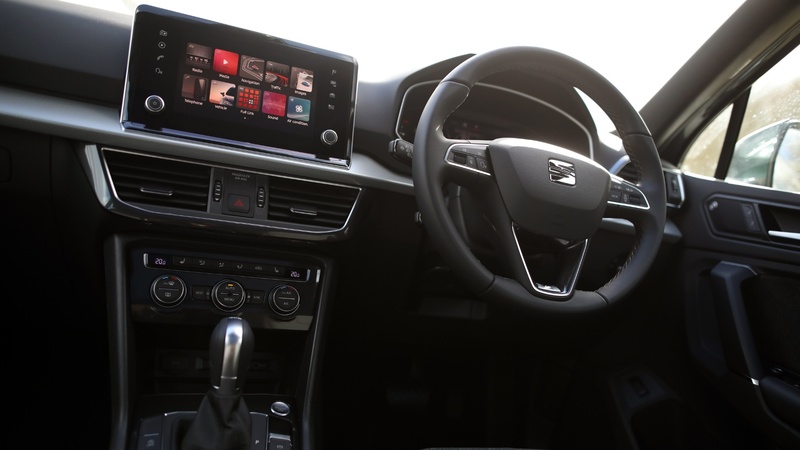 As for the driver, you get digital dials, and a media system with Apple Carplay and Android Auto connectivity. Shame the eight-inch touchscreen, perched atop the dashboard, looks like an afterthought. 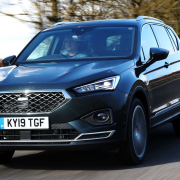 New Seat Tarraco SUV – driven here in 2.0 TDI 190 DSG Xcellence spec. 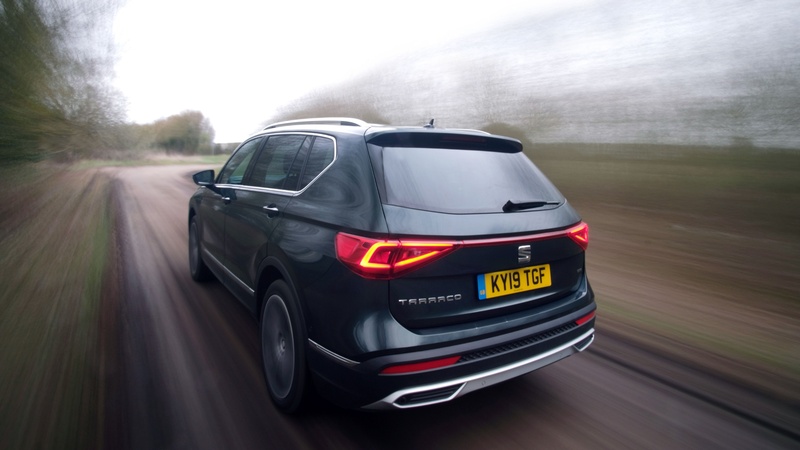 Overall, the effect is pleasingly premium, as befits the Tarraco’s range-topping status. I particularly liked the wool and Alcantara (man-made suede) upholstery of our Xcellence-spec test cars. Standard kit on the entry-level SE includes 17-inch alloys, three-zone climate control, rear parking sensors, auto headlights and wipers, cruise control and ambient interior lighting. SE Technology adds 18-inch alloys and sat nav, while the Xcellence and Xcellence Lux push upwards into Audi territory. If you’re quick, launch-spec ‘First Edition’ cars are even better equipped. If you’re expecting a lively drive to match that purposeful mien, prepare for mild disappointment. The Tarraco doesn’t transcend its SUV origins like a Porsche Macan, and unless Seat’s sporty sub-brand Cupra gets involved (as with the smaller Ateca), that’s likely to remain the case. Refinement and long-distance comfort are more the Seat’s raison d’être. Its suspension soaks up potholes very effectively – particularly if you opt for smaller wheels – and both petrol and diesel engines are hushed. For maximum quietness, wait for the plug-in hybrid version, due in 2020. On twisty roads, the Tarraco is planted and predictable. Its steering is nicely weighted, body-roll is kept in-check and the DSG ’box is smooth and intuitive. Its brakes also feel reassuringly robust, backed up by standard-fit Front Assist with pedestrian and cyclist detection. The predicted best-seller – the 150hp 1.5 petrol – wasn’t available to drive at launch. However, the perky 190hp petrol would be my choice versus the slightly sluggish 190hp diesel. For starters, it costs around £1,500 less, while the quoted fuel economy is hardly leagues apart (29.7mph versus 37.2mpg). And the diesel was just 3mpg more efficient on my identical test-route. Seat has hit upon a winning formula. Its sales were up 12 percent in 2018, making it the UK’s fastest-growing car brand for the second year in a row. 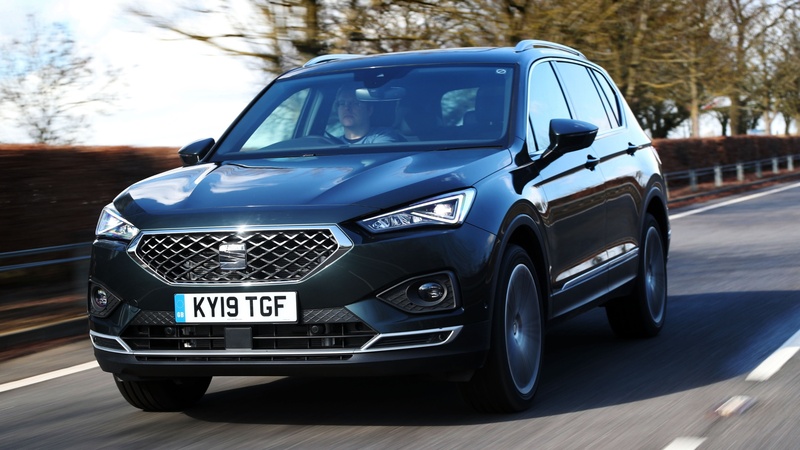 Given such success, it’s hardly surprising the Tarraco doesn’t break the mould. No, it isn’t a mobile Tardis like the Alhambra, but that’s hardly the point. For better or worse, the sort of people who occasionally tackle a gravel track en route to a National Trust property want SUVs. And this is a pretty good one: comfortable, refined, well-equipped and inoffensive to drive. The greatest threat to the Tarraco comes from within. The aforementioned Skoda Kodiaq starts from around £3,000 less, and is a cheaper option spec-for-spec. Not quite the ‘reign in Spain’, then – more like Czech mate. How much did our test car cost?